Note: This coffee time page is part of a series of blogs that we did while learning Spanish language in Peru. Each blog focuses on one or two language learning strategies. They are designed so show you how to implement Walkabout language learning strategies. Use our examples here for any language you want to learn. See the "More Peru Stories" list of links on this page for additional language learning strategies. Also see our Learn Spanish section. 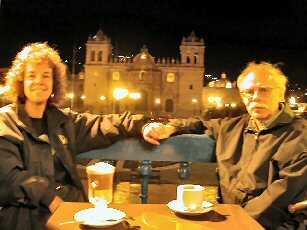 Ann and Terry enjoy coffee time looking over the plaza in Cusco. Coffee time: It shouldn't be this hard to find a cup of java. It's Peru, after all. They grow it here. We're in Chivay and I've checked two restaurants and a "coffee house." I've wised up – before I order I ask if they serve "real coffee:" coffee brewed in a machine. I've got the dialog down perfectly. Step 2 of Walkabout Language Learning is Prepare a dialog. I've practiced it with my mentor, and now I'm communicating with locals. Our fourth stop: I finish my well-honed dialog, ". . . so, do you have real coffee or Nescafé?" "Oh, no señor! Café de Perú." 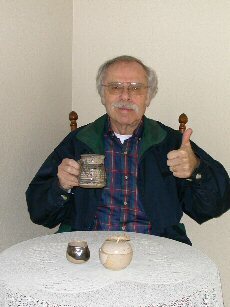 The guy grins, pulls out a small, tubular packet of instant coffee from the shelf behind him, holds it up triumphantly. The package reads, Hecho en Perú. Yep, Peruvian coffee, alright. But instant coffee is instant coffee. The search goes on. I've had excellent coffee here, no question – in a couple of expensive tourist restaurants overlooking the main plazas in Cusco (see photo) and Arequipa, on the pedestrian mall in Puno, in the tourist haven that is Aguas Calientes, where you pay an arm and a leg to eat out. Oh, and if you prefer cappuccino, that will triple the price. Ironically, they call the good stuff Café Americano, but I can't force myself to say that. It's too incongruent. But in the local restaurants where we normally eat to keep costs down, and at the hostales, when we rise at dawn for our free breakfast of bread, juice and hot drink before we race off for the day's tour, it's always Nescafé. I've tried a few cups, but I can't do it anymore; I've gone to drinking tea on the road. I've been spoiled by Zonia (my Cusco "mother"), who brews up a stout pot of Cusqueñeo coffee (Cusco coffee) that sends me zinging off to class each morning. I guess I'm searching for Zonia's unknown twin, a café owner who appreciates the worth of a good, strong cup of coffee. It's late afternoon in Chivay. I still haven't had my morning cup; coffee time has come and gone twice already. We leave the plaza and head down a side street past the market. A small sign down the block and across the street grabs my attention: "Coffee Shop." We enter. Two small tables and a glass-fronted display case with cakes, pies, and puddings fill the café. A girl looks up from her homework. She's dressed like a waitress. I roll out my patented dialogue. She stares at me. I try again. "Sí, café de maquina," she says. She points to a coffee machine, then adds, "but we don't have any made." A cheery woman bustles into the café from the street. The girl explains that the gringo here wants café americano. I whip out my well-worn dialogue, ever hopeful coffee time has arrived. Ah, this cup was worth waiting for (see photo). . . Coffee time melts into an hour chatting with her. An older woman comes in – quite a bit older, white haired, but with perfect skin, beautiful and serene in the way that mature women can be. The shopkeeper introduces us. The woman stares at me. Her eyes grow huge. "¡Que bellezo!," she says ("How handsome"). I'm floored. Nothing more need be said – I wanted to bundle her up and bring her home with us. Terry found real Peruvian coffee. The shopkeeper tells us after her friend leaves, "She has breast cancer. They can't do anything about it. It's so sad." We chat more, squeezing language practice into coffee time. I tell her we're puzzled over several of the listings on her bilingual lista (menu), especially “cream of milk.” She tries to explain. We finally figure out a translation of what she's describing – milkshake – and explain our image of "cream of milk." She laughs. No wonder so few tourists order it, she says. I'm hesitant, but I forge ahead and point out several other errors. She's appreciative and asks me to write the corrections in her notebook. (She has only that one menu, so I don't mark on it.) She'll change it next time she redoes the lista, she says. We exchange e-mail addresses. We give her our card. At last, we pull ourselves away. We'll be back, we tell her – for breakfast and another coffee time chat. She hugs each of us. "I'll be open," she says. Use your dialogue to guide your search: sometimes it brings real rewards. Here at least, ask for a lista, not a menu. A lista is that printed paper that lists the items a restaurant serves; menu refers to the food items themselves, not that printed list. November 7 update: Annie and I ate breakfast at Amanda's shop this morning. (We finally thought to ask her name.) Shawn missed out: he's back at the hostal, sick in bed. Later, Annie returns yet again to order a sack lunch, and as it turns out, to accept Amanda's special gift for Shawn. See Annie's story of her search to help Shawn after he drank contaminated bottled water. You can use visits to local restaurants -- whether you are there for coffee time or any other time -- to practice your new language. Download the Walkabout Language Learning Action Guide to learn how.